The city of Logrono, capital of La Rioja, celebrates its most famous export with the Fiesta de la Vendimia Riojana, the Rioja Grape Harvest Festival, in late September every year. From 20th until 25th September 2013, Logrono will honour Saint Mathew but also Bacchus and the region's best known produce - La Rioja wine. Walk section two of the French Way route of the Camino de Santiago from Pamplona and reach Logrono just in time for this fun-filled festival, with CaminoWays.com, the walking and cycling holiday specialists. During this 7 day holiday you can experience the 'Treading of the Grapes', which sees young people in traditional costume tread the freshly picked grapes to get the first grape juice of the season, which will then be offered to the Virgen de la Valvanera. Also famous for its tapas, Logrono is a great place to discover La Rioja's classic dishes, following the city's tapas trail at the lively Calle del Laurel. Concerts, fireworks, tastings and other activities will fill the streets of Logrono with fun and music for the Harvest Festival. Start the walk in Pamplona and head towards La Rioja along the Alto del Perdón, with its famous pilgrim statue. Along the way, visit charming towns and small villages with plenty of history in the Rioja wine producing part of Navarra - such as Puente and de la Reina, Estella-Lizarra, where you will pass the wine fountain at Bodegas Irache and Viana. Enjoy this culture-filled walking holiday with CaminoWays.com from just €569pps, based on travel in September 2013. 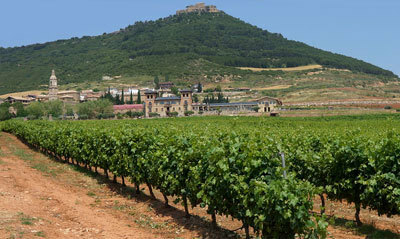 Price includes: Luggage transfer, accommodation, holiday pack and an additional night in Logrono. Request a free quote or book today by logging onto caminoways.com.